New Orleans is the most European of cities in America. With fabulous dining, entertainment, and scenic sites, you won't find a sweeter place to spend with your sweetheart. 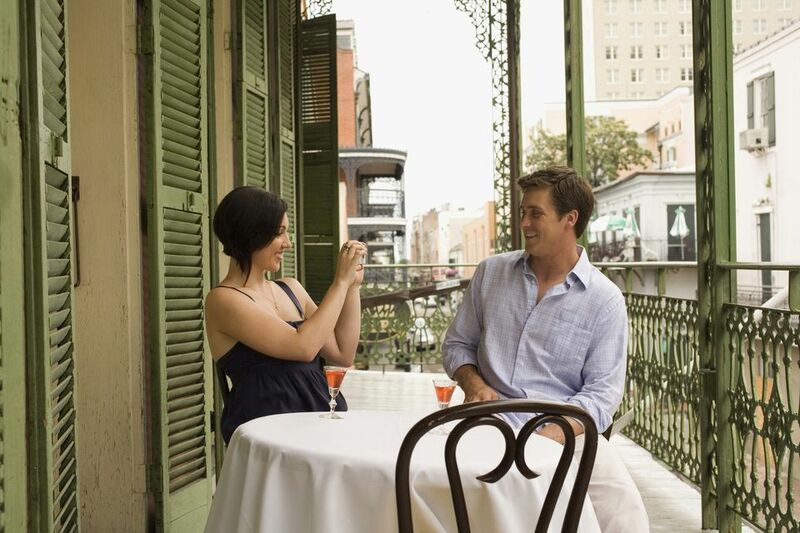 Whether you are celebrating a honeymoon, an anniversary, new found love in bloom, a rekindle of a long time love affair, New Orleans will exceed your expectations for a romantic getaway any time of the year. New Orleans is a fun-filled city no matter what time of year you come. Fodor's.com named New Orleans the best place to ring in the new year. That's for a good reason. The big celebration on the Riverwalk, with music and the spectacular fireworks display over the Mississippi River, added to the other fun places to go in the French Quarter make for a great and romantic visit. Add a few days ahead to include some of the Christmas in New Orleans holiday activities. February brings Mardi Gras with all the balls and parades. It can be hectic, but it can also give you and your favorite person a chance to really cut loose and be free of the boring normalcy of everyday life. Spring is the time for Spring Festivals. The weather is perfect and there's a festival with great music and food almost every weekend. Check out the French Quarter Festival, or the Big Daddy of New Orleans music and food festivals, the New Orleans Jazz and Heritage Festival. Summer brings great deals on hotels, the Essence Music Festival, and much more. New Orleans has that tropical climate that brings warm sultry nights filled with the smells of Jasmine and other fragrances that make it perfect for romance. With Fall comes football, more festivals, Halloween, hauntings and more. The weather is crisp, the air is filled with fun and it's the perfect time to walk or Take a Carriage Ride to see the storied streets of New Orleans. Where you stay is important. Consider the location, the view from your room, the amenities before you choose. Check the room service menu and always ask for a free upgrade when celebrating a special occasion like an anniversary or birthday. When planning a trip to New Orleans, the French Quarter is the place most tourists want to be, and there are many wonderful hotels in that area. Just outside of the French Quarter on Esplanade Avenue there are some quaint B&Bs to consider also. The uptown area of New Orleans has some great hotels and is just a streetcar ride away from the French Quarter. Have you ever considered a haunted hotel? Here are the most haunted hotels. Romantic restaurants are plentiful in New Orleans. Find one with service on a beautiful courtyard, like Broussard's. Or, choose one with a beautiful view like Ralph's on the Park. Dinner in a classic New Orleans Creole restaurant can really spice up your evening. Here's a list of some of the most romantic restaurants in New Orleans. New Orleans is a mystical place. It's historic, romantic, part of the South. But, most of all New Orleans is part of the soul of America. Just walking along one of the storied streets is inspirational. Stroll Through Living History around Jackson Square. Kiss in all of the Most Romantic Places in New Orleans. Take a riverboat ride. Spend an evening on Frenchmen Street listening to live music. Most of all, have fun, live more and love more when you're in romantic New Orleans.